Higher resolution image of the side panel. The D2-125 laser servo was designed for low-noise servo control of lasers and other experimental systems. The PI2D loop filter, with two-stage integral feedback, provides tight locking to cavities and atomic/molecular transitions. 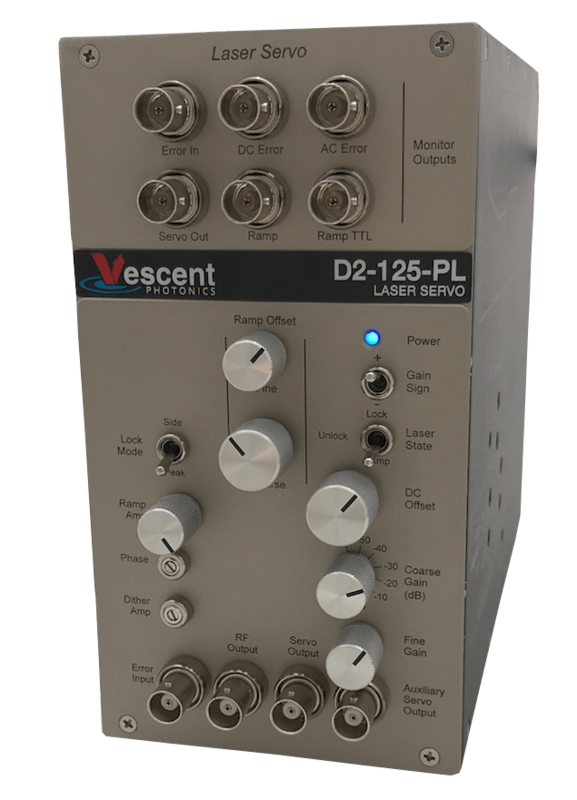 The D2-125 provides full user-control over the loop-filter parameters, which enables servo-loop optimization for a wide variety of plants, such as current tuning, acousto- and electro-optic modulators, voice coils, piezo actuators, etc. Lock Guard auto relocking function is now included with every D2-125 Laser Servo. 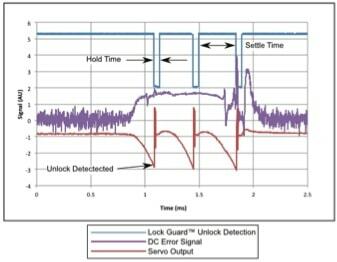 Lock Guard detects when the servo loop filter has gone out of lock and automatically tries to recapture lock. Lock Guard monitors the servo output and when it detects an Unlock Point (a fast change in the servo output; see arrow on the red trace), it disengages the servo and returns the output to the last known valid value. Lock Guard waits for the Hold Time (shorter interval on blue trace) and then re-engages the lock. 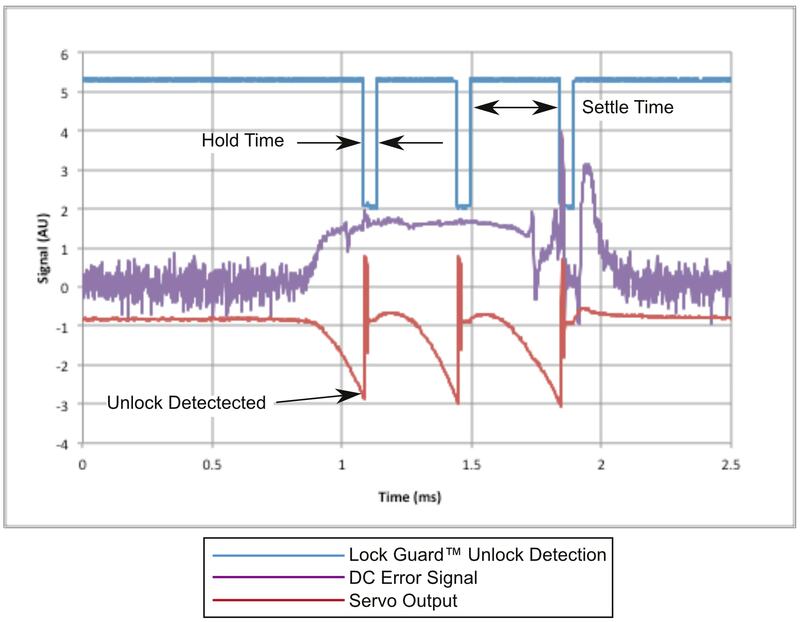 Lock Guard waits for the Settle Time (longer interval on blue trace) and if it detects that the system is still out of lock it will reset the servo output again. In the image, Lock Guard made three relock attempts before the challenge was removed and relock was achieved. (The beam was actually blocked and unblocked during this time.) The Lock Guard control parameters, Unlock Point and Hold & Settle Times, are all user adjustable for maximum flexibility and optimized performance. The D2-125 has the flexibility to optimize its performance for your experiment. The Peak Lock option provides an adjustable-amplitude 4 MHz dither which can directly modulate a diode laser or drive an external modulator. The incoming error signal is then demodulated at this same 4 MHz (with adjustable phase.) 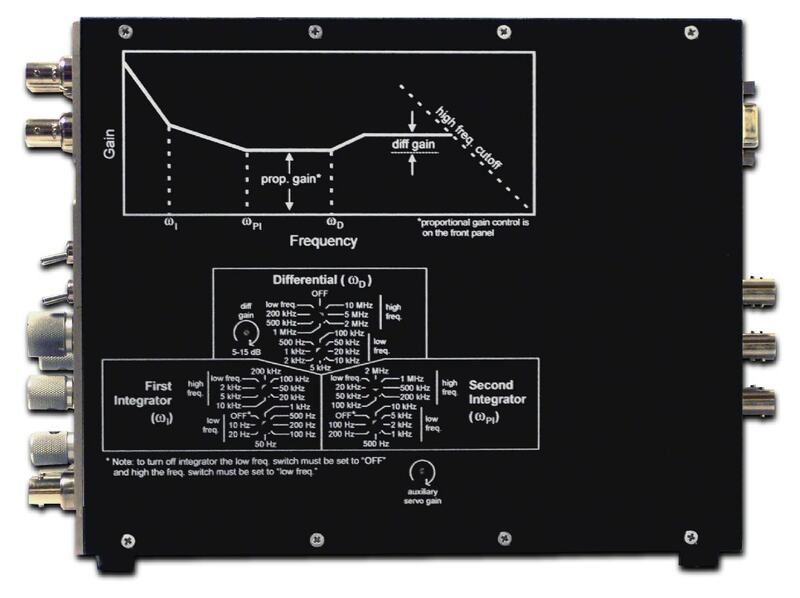 The resulting first derivative error signal allows the user to lock a laser to the peak of the error feature instead of the side without the implementation of an external modulator and lock-in amplifier, simplifying and reducing the cost of many experimental configurations. In most cases, the D2-125 will be powered by the D2-005 linear power supply. The D2-005 will power up to 4 servos or D2-100 lasers and so is quite convenient. But some situations call for a dedicated servo with a small footprint. The Internal Power option integrates a smaller linear supply into the D2-125 chassis, minimizing precious space needed for the locking electronics. Ramp Centering is now included on all units, and allows the user to bias the servo output while preparing the system for lock up. This is useful, for instance, when servoing a PZT or other transducer that does not operate around a zero set point. The D2-125 was designed to integrate into our Rackless Rack. As such, it may be powered with our D2-005 or from an adjacent D2 electronics module. View a typical configuration of a D2-125 servoing a D2-100-DBR laser.